Photo: Wynton Marsalis and the Jazz at Lincoln Center Orchestra in front of E.J. Gold's JazzArt® June 2011. Photo by Vidad Flowers. Taken and used with permission. E.J. 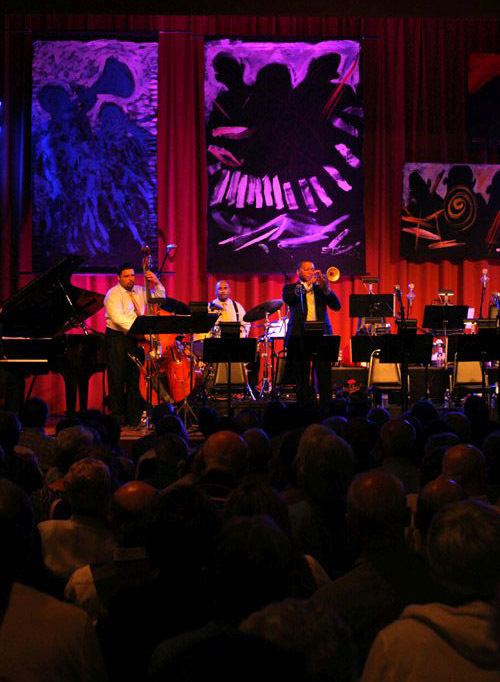 Gold's dramatic 7'x 11' JazzArt® stage panels and paintings grace the performance space, as Wynton Marsalis takes the stage at the Grass Valley Veteran's Memorial Hall in a gala concert presented by the Center for the Arts.